Is this also undefined behavior in C, or should this really lead to a stack overflow and then why does this result in a stack overflow? 1 I would like to know is infinite recursion allowed in C? Whenever you call a function, the arguments are pushed on the stack, which means that data on the stack segment is "allocated". When the function is called, the return adress is also pushed on the stack, by the CPU, so it knows where to return to. In your example case this means, that no arguments are used, so the only thing that is pushed is the return adress, which is rather small (4 bytes on x86-32 architexture), and additionally the stackframe is adjusted which takes another four bytes on this architecture. From this is follows that, once the stack segment is exhausted, the function can not be called aynmore and an exception is raised to the OS. Now there can happen two things. Either the OS forwards the exception back to your application which you will see as stack overflow. Or the OS can try to allocate additional space for the stack segemnt, up to a defined limit, after which the application will see the stack overflow. mov eax, 0                 ; this will never be executed. Of course this doesn't answer whether it is defined what happens when the stack overflows. However at least it allows main to be called recursively, while this is explicitly forbidden in C++ (Section 3.6.1 Paragraph 3 and Section 5.2.2 Paragraph 9). Whether a program recurses infinitely is not decidable. No sensible standard will ever require a property that may be impossible to verify even for conforming programs, so no C standard, current or future, will ever have anything to say about infinite recursion (just as no C standard will ever require conforming programs to eventually halt). The iteration becomes infinite if the stopping condition (the if check to return from the function) is removed. There is no returning from the recursion. So the information that is remembered for each successive function call (the local x and the address of the caller) keeps piling on until the OS runs out of memory to store that information. The result of this infinite recursion is a simple infinite loop, and there will be no overrun of the "stack". So, infinite recursion is allowed since infinite loops are allowed. Your program, however, is not a candidate for tail call optimization, since the recursive call is not the last thing your function does. Your function still has a return statement that follows the recursive call. Since there is still code that needs to execute after the recursive call returns, the optimizer cannot remove the overhead of the recursive call. It must allow the call to return normally, so that the code after it may execute. So, your program will always pay the penalty of storing the return address of the calling code. The standard does not speak to "infinite recursion" in any specific terms. I have collected together what I believe relevant to your question. For such an object that does have a variable length array type, its lifetime extends from the declaration of the object until execution of the program leaves the scope of the declaration. If the scope is entered recursively, a new instance of the object is created each time. The standard talks about memory allocation failure in numerous places, but never in the context of an object with automatic storage duration. Anything not explicitly defined in the standard is undefined, so a program that fails to allocate an object with automatic storage duration has undefined behavior. This would apply equally between a program that just had a very long function call chain or too many recursive calls. Whenever you make a function call (including main()), the function call "info" (e.g. arguments) is pushed on top of the stack. This info is popped off the stack when the function returns. But as you can see in your code, you make a recursive call to main before you return, so stack keeps on growing until it hits its limit and hence the segmentation error. The size of the stack is often limited and decided before runtime (e.g. by your operating system). This means that stack overflow is not limited to main(), but to any other recursive functions without a proper way to terminate its tree (i.e. base cases). Even if the function does not use stack space for local variables or argument passing, it still needs to store the return address and (possibly) the frame's base pointer (with gcc, this can be disabled via -fomit-frame-pointer). On high enough optimization levels, the compiler might be able to re-write the recursion into a loop if the tail-call optimization in applicable, which would avoid the stack overflow. I would like to know is infinite recursion allowed in C? This article Compilers and Termination Revisited by John Regehr is answer on whether the C standard allows infinite recursion or not and after combing through the standard it is not too surprising to me that conclusions is that it is ambiguous. The article main thrust is about infinite loops and whether it is supported by the standard of various languages(including C and C++) to have non-terminating executions. As far as I can tell the discussion applies to infinite recursion just as well, of course assuming we can avoid a stack overflow. accesses are complete and subsequent accesses have not yet occurred. messages actually appear prior to a program waiting for input. So there you have it: the compiler vendors are reading the standard one way, and others (like me) read it the other way. It’s pretty clear that the standard is flawed: it should, like C++ or Java, be unambiguous about whether this behavior is permitted. Since it seems like there are two reasonable yet conflicting interpretations of the second condition the standard is deficient and should define explicitly whether this behavior is permitted. The stack section of the main memory is not infinite, so if you call a function recursively an indefinite number of times, the stack will be filled of informations about each single function invocation. This lead to a Stack Overflow, when there's no more space to use for any other function invocation. Is infinite recursion allowed in C? The simple answer is Yes. The compiler will allow you to call a function infinitely until you run out of stack space; it will not prevent you from doing this. Is infinite recursion possible? No. As pointed out already, each call to a function requires a return address to be pushed on the program stack, along with any parameters the function requires to operate. Your program only has a limited stack size and once you use up your stack your application will fail. Is fake infinite recursion possible? Yes. It is possible to design a function which calls itself 1000 times and then allows itself to exit from the 1000 function calls, so that the stack only has the original function call on the stack... and then repeat the whole process all over again in a infinite loop. I don't consider this real infinite recursion though. Infinite recursion is allowed in C. At compile time, the compiler will allow this, but you may get a runtime error upon doing so. and the Stackoverflow happens simply, because each state of the calling scope, has to get stored, so if infinite states of scope have to be stored, your anywhen running out of memory, as you don't have infinite memory space. And this is defined behavior, because it is happening on runtime, and the compiler doesn't need to check in respect of the standard, if the recursion ever gets broken. I just looked at copy a recent draft c standards doc and none of the recursion references talk about infinite recursion. If the standard document doesn't require the compiler to support something and doesn't ban it, then compiler developers will consider this undefined behavior. Not the answer you're looking for? Browse other questions tagged c recursion or ask your own question. Why does a tail recursive function lead to a segmentation fault? Is this infinite recursion UB? What parts of a process' virtual address space are overwriteable? 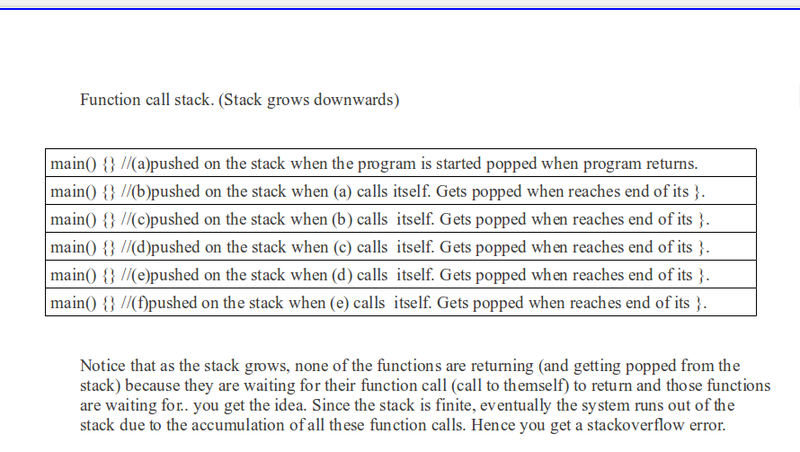 What will happen if function goes out of stack space during infinite recursion? Why stack overflow causes segmentation fault instead of stack overflow in Linux? What happens if I catch SIGSEGV and the signal handler causes another SIGSEGV?